To make the sauce, melt the butter in a pan over a medium heat. Add the flour and stir to form a smooth paste, then add the crumbled Stilton and stir until melted and smooth. Now gradually stir in the milk and port. Bring the mixture to the boil, whisking all the time. Then reduce the heat and simmer for 2-3 minutes, by which point the sauce should have a smooth and creamy finish. Season well with black pepper (Stilton is already pretty salty). Keep the sauce warm while you prepare the steaks, placing a piece of clingfilm on the surface to stop a skin forming. Season the steaks with pepper. Melt the butter and oil in a large frying pan over a high heat. Add the steaks and brown them on both sides. Reduce the heat to medium and cook for a further 3-5 minutes each side, according to taste. Transfer to a plate and keep them warm while they rest for 3-4 minutes. Season with salt. 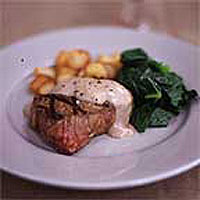 Serve the steaks and sauce with sautéed potatoes and seasonal veg.